We at In the Loop are particularly fond of stories about our patients and the care they receive at Mayo Clinic. We often wonder, though, as you may, what happens after these folks leave the hospital. So we were excited to catch up with one patient who captured our hearts to learn more about what life has been like for her and her family since they returned home. We introduced you to young Aria Grams in August, when she was waiting for a heart transplant. She received that gift of life in September, and another gift, just days before Christmas: She was finally able to go home, after seven months in the hospital. "It is amazing to be back," says Aria's mom, Tara, who stayed by her daughter's side throughout her hospitalization. The best part? "Just doing the dishes, feeding the kids, eating dinner together — all the things you take for granted," she says. Aria's dad, Josh, and big brothers, Tristan and Noah, are delighted to have "their girls" back, too. 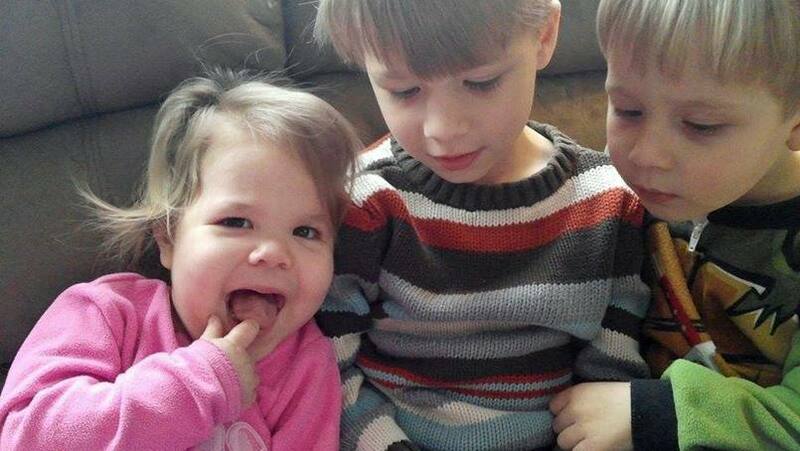 "The boys keep telling Aria that they love her, and try to share all of their toys with her," Tara tells us. For her part, Aria seems to be adjusting well. "She laughs all the time," her mom says, "and follows her brothers with her eyes." Aria's return also marks the beginning of a new normal for the family. "We have to create a hospital environment in our home," says Tara. The Grams have replaced carpet with hard surfaces and placed bottles of hand sanitizer strategically throughout the house. Shoes and coats now come off at the door, as do Tristan and Noah's clothes. "They change clothes as soon as they get home from school," Tara says. "We have to keep dirt out." Aria takes 15 medications a day, and is still receiving nutrition through a feeding tube in her stomach. She'll soon begin physical, occupational and speech therapy, all designed to help her regain strength and abilities lost after a series of strokes caused by an allergic reaction to a medication. As Tara looks back on her daughter's experience, she often thinks of the many people who have reached out to support her family. "You see so much negative stuff in the news, but you never hear the good stuff," she says. Good stuff like the hundreds of cards and letters she's received, all of which she's saved and plans to answer. And the messages of support that have come through Aria's Facebook page. And the strangers who sent the family gifts in the hospital, kept Aria in their prayers, and shared their own transplant stories. And the generosity of a family, deep in their own grief, who made the wondrous decision to donate their child's organs so that others, including Aria, might live. Share some positive vibes of your own below. You can use the handy social media tools to share this story with others.